It’s hard to say what a good dental hygienist salary is. There are a variety of factors involved and it depends on each hygienist and each office they work at. You also have to take into account that most dental hygienists work in a clinical setting. But, there are also many who work in education and corporate industries, to name only a couple. Each industry has its own set of nuances and demands. 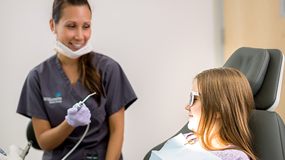 Years of experience, the level of financial prosperity of each office, and geographic factors are often key factors in determining a dental hygienist salary. But the bottom line is the value each practice or business owner places on the hygienist(s) they employ. However, wages are often negotiable despite what you may think. The first and most important thing to understand about dental hygienist salary negotiations is that hygienists can and do influence the economic success of practices and corporations. A dental hygienists’ ability to communicate and build relations with customers has significant value. This doesn’t necessarily mean a dental hygienist can demand whatever they want. Handle your salary negotiation strategically and systematically. The dental hygiene job market is saturated and most dental hygienists are going into their jobs with only a hint of a successful track record until they have actually worked there. Add to that the fact that most dental employers feel they are in the driver’s seat when it comes to setting wages of hygienists. Employers tend to have a “take it or leave it” attitude. But there are things you can do to change that over time. As such, salary negotiations can sometimes be best navigated after a hygienist has been working for a period of time at their office. Below is a link to all our best dental hygienist salary negotiation tips.